I did spare some time to test my Home Server again. It turns out that it is the drive enclosure that was flaky and causes the Home Server to misbehave. I had a clue which drive enclosure it could be because out of the 3 drive enclosures still connected to the server, 1 does not have the light on. After exchanging the drive enclosure with a spare external drive, and connected everything back with the server, everything seems to be normal again. 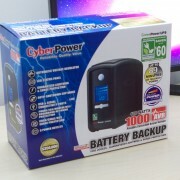 I still don’t think it is very safe to store my data in external USB drives. After having numerous problems with this setup, it probably is time to retire this aging hardware and replace it with a newer setup for the sake of my data. 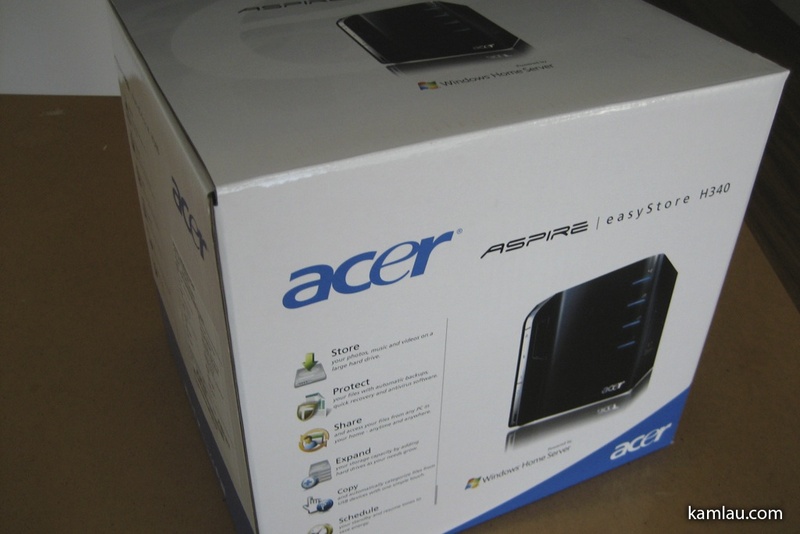 So I actually ordered and picked up the Acer easyStore Windows Home Server from NCIX (a local computer chain store in Canada). Foam piece removed, you can see the cube-shaped server. 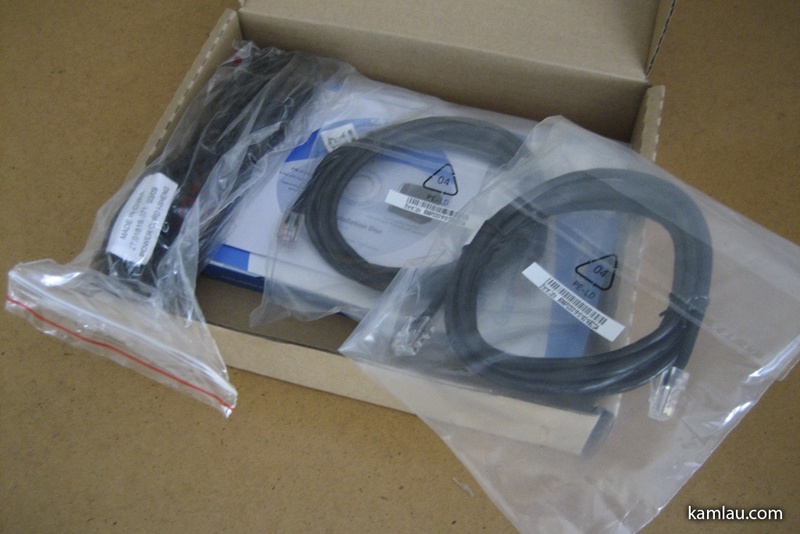 The box beside the server contains two network cables and a power cable. 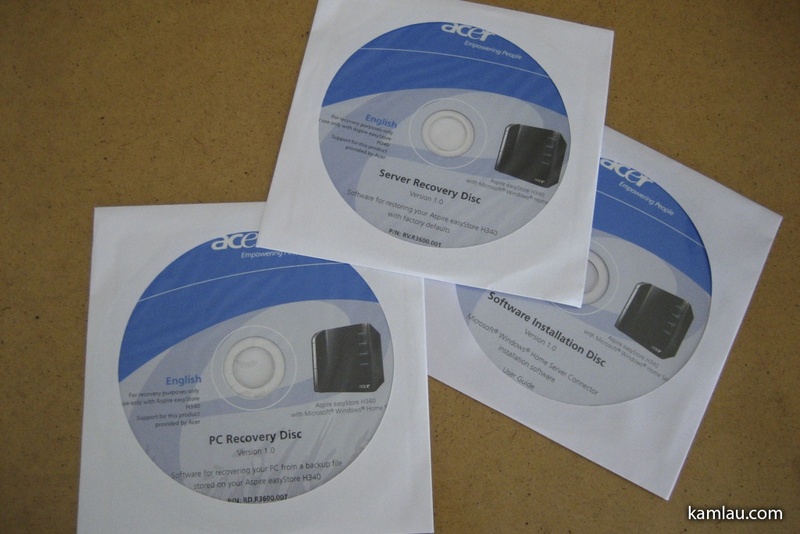 Also some CDs, one for installing the Windows Home Server Console to the client computer (like our laptops), one for server recovery, another for PC recovery. Let’s hope we will never have to use the last two. There is also some documentation. The quick start guide is written in 25 languages. 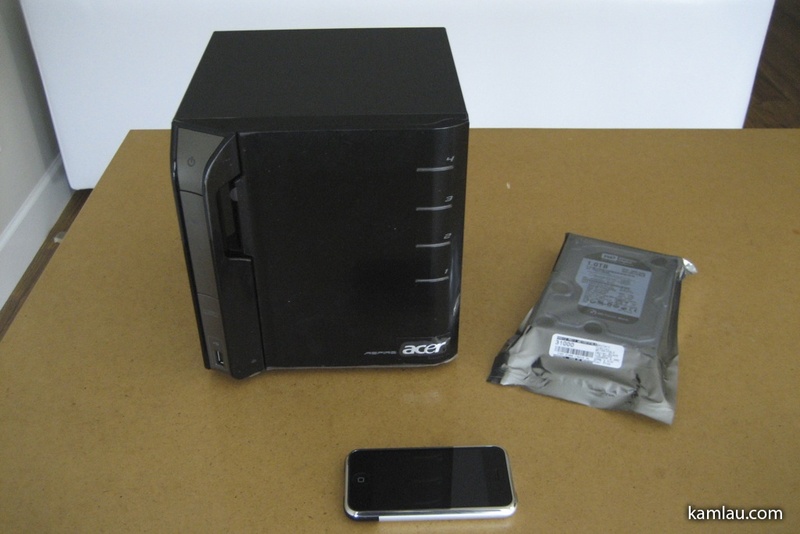 As mentioned while I was looking into the NCIX deal, this package comes with two 1TB drives. 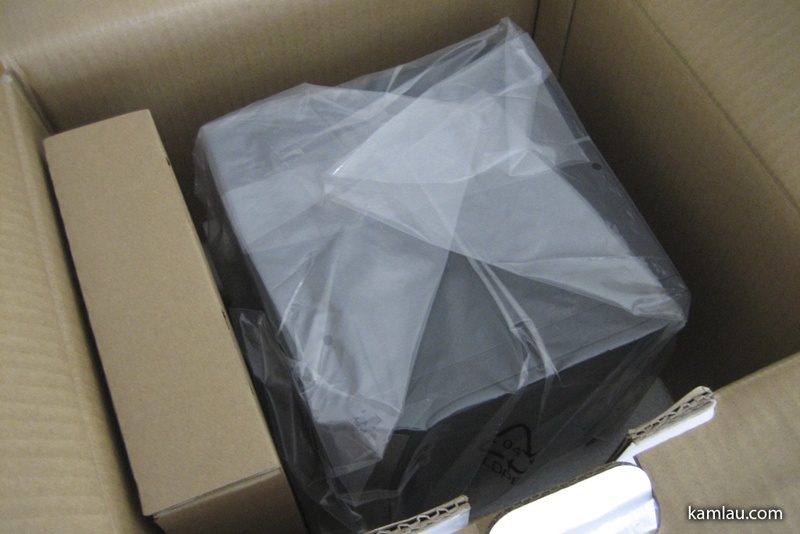 One already installed into the server, another one I have to install myself (still wrapped inside the anti-static bag). 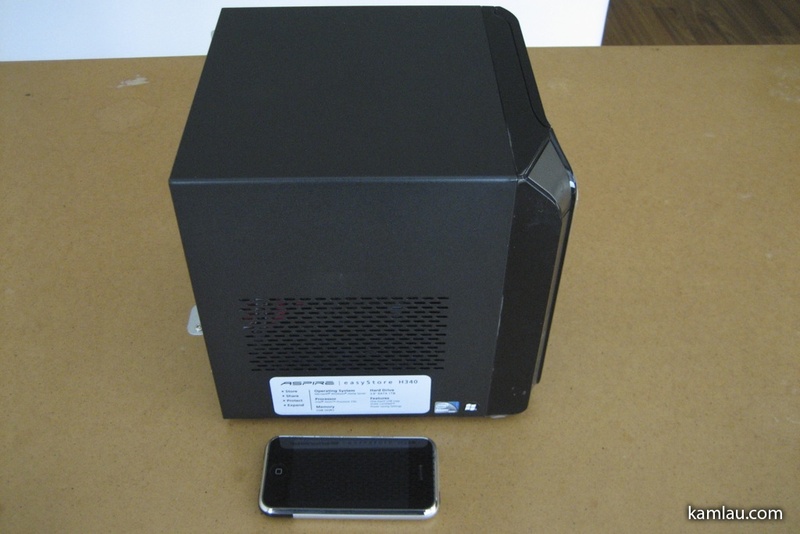 The iPhone is for scale comparison and did not come with the NCIX deal. 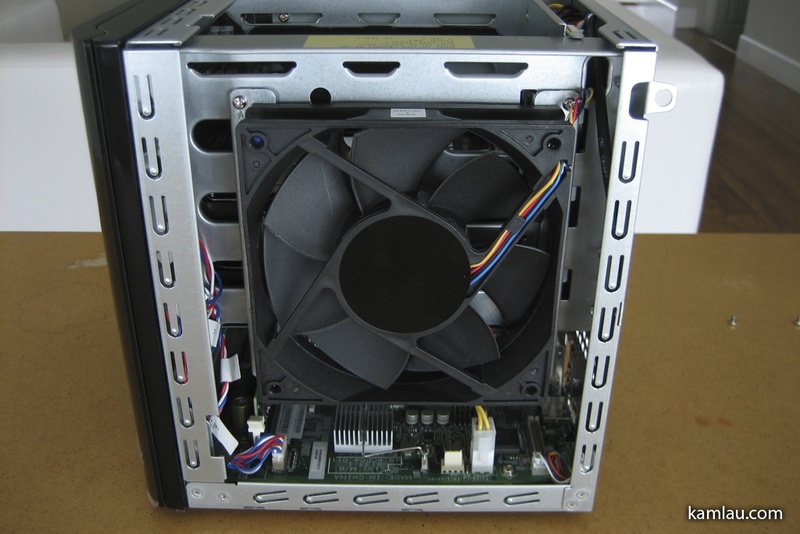 The front of the home server has a door for accessing the drive bays. The bars under the numbers on the left side are drive lights, only the drive bay with a connected hard drive will light up. Let’s look at the right side if the server. On the top is the power button. 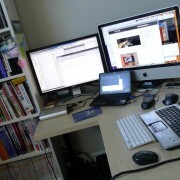 There are some lights in the middle, one for network activity, one for hard drive activity and one for status. 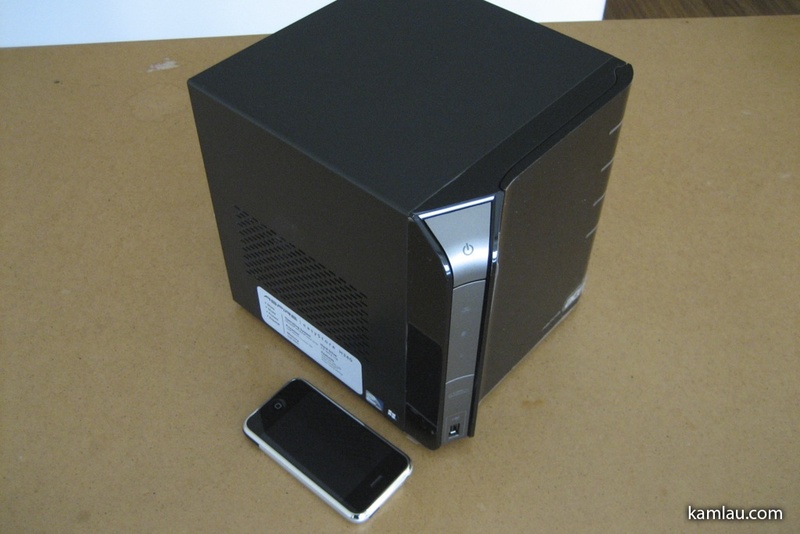 And at the bottom is a USB port and a button for backing up your home server to an external hard drive. 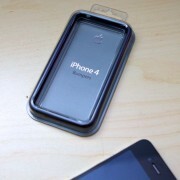 I wonder how practical the backup will be. I imagine I will put up to 4TB of storage on this server. And if I want to back this up to an external USB drive, it will have to be big enough to store all my data…. The right side of the server has some grills for air intake. 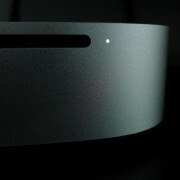 On the back, you can see a small fan for the internal power supply and the power connection. 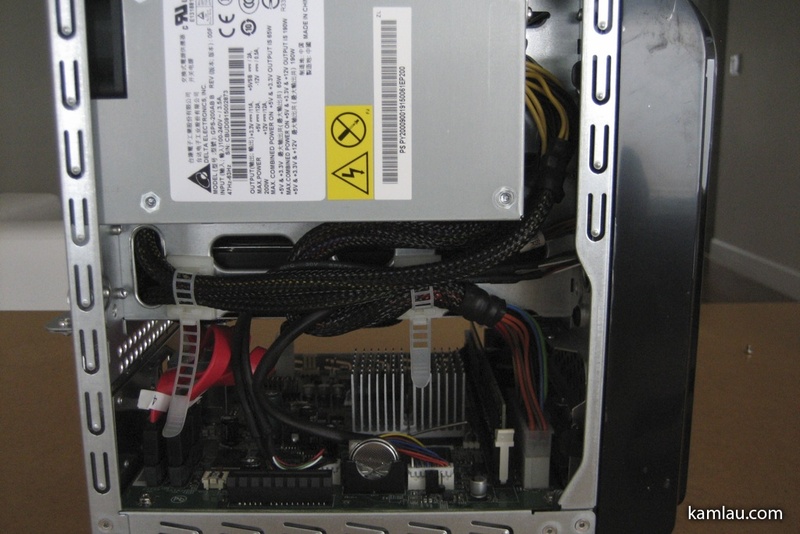 Below that is a slot opening for a half height PCI-E card. At the bottom are 4 USB ports, an eSATA port, a Gigabit Ethernet port and a circular hole I assume is a reset button. One thing to notice is that there are no display ports. 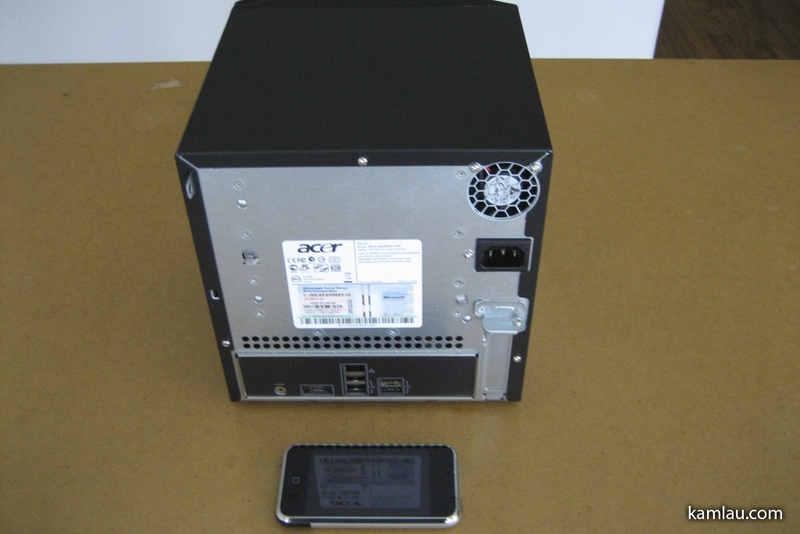 This server runs totally “headless” and relies on a remote connection to control it. And on the left side are more grills for heat dissipation. 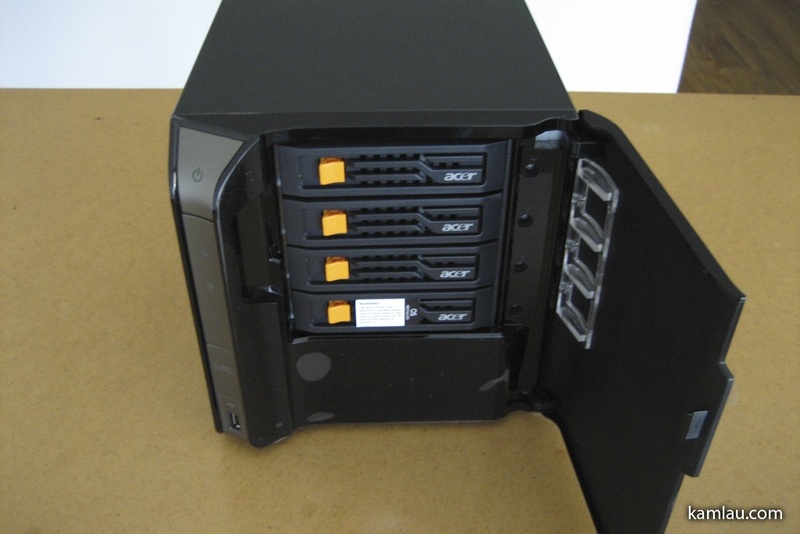 Opening the front door and you will see 4 removable drive bays. The video below shows how easy it is to remove a drive bay from the server. This is what it looks like inside. 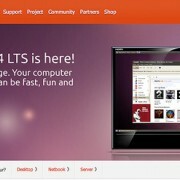 The server comes with one hard drive pre-installed and that is where the Windows Home Server operating system is. After a drive bay is removed, you can see that there is the SATA connection on the far side. 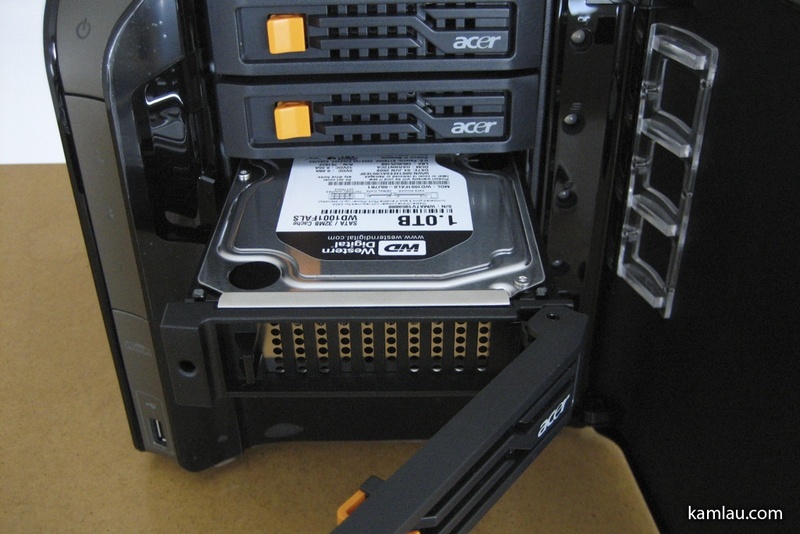 Compared to P-ATA, the SATA connection enables removable drive bays to be much smaller. This is the 1 TB drive that came with the server. 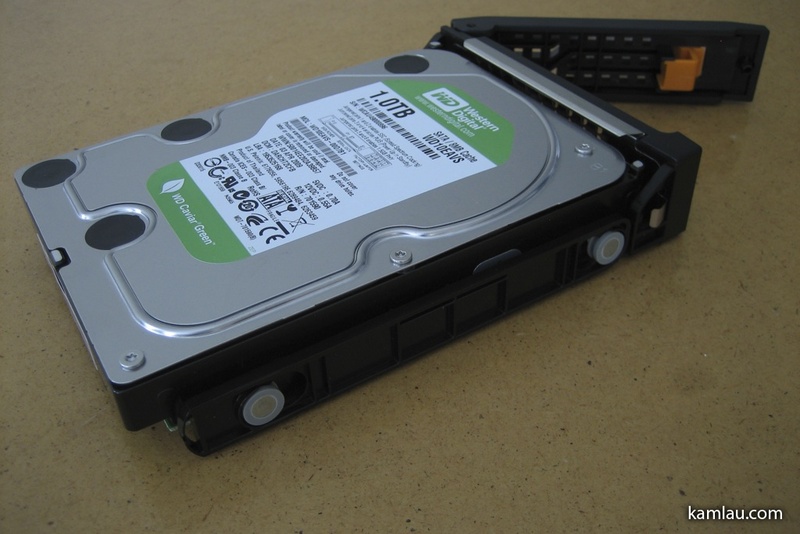 It is a “Green” Western Digital hard drive. “Green” means it runs using less energy, but the spindle speed is slower, too (5400 rpm instead of the usual 7200 rpm). This is an empty drive bay. 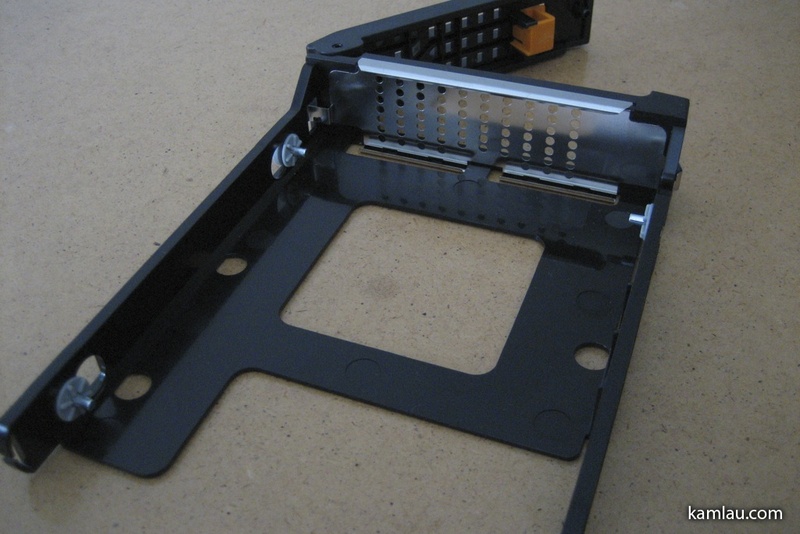 There are no screws to secure the hard drive, instead, there are 4 pins that are secured to the plastic bracket with rubber material for vibration isolation. 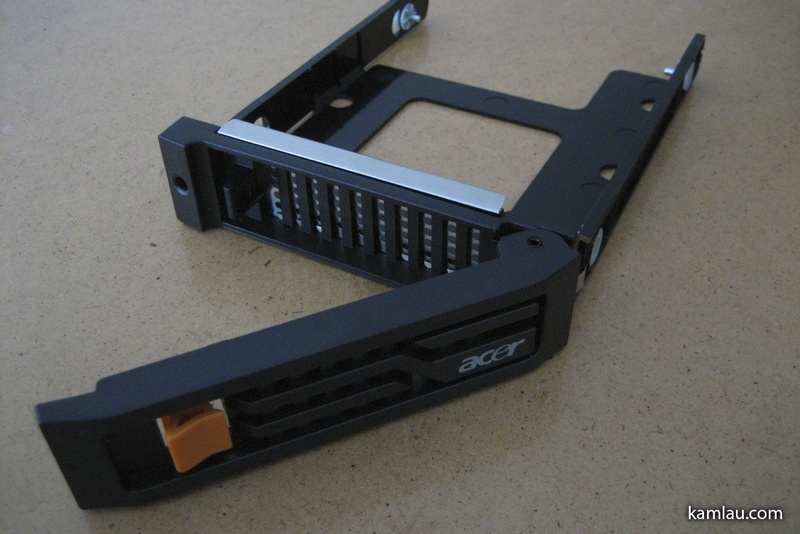 To install a drive, you just simply slide your drive on one side and position the two pins into the screw holes on one side of your hard drive, then lightly widens the plastic bracket and slide the other side into position. The pins secure the hard drive very well. 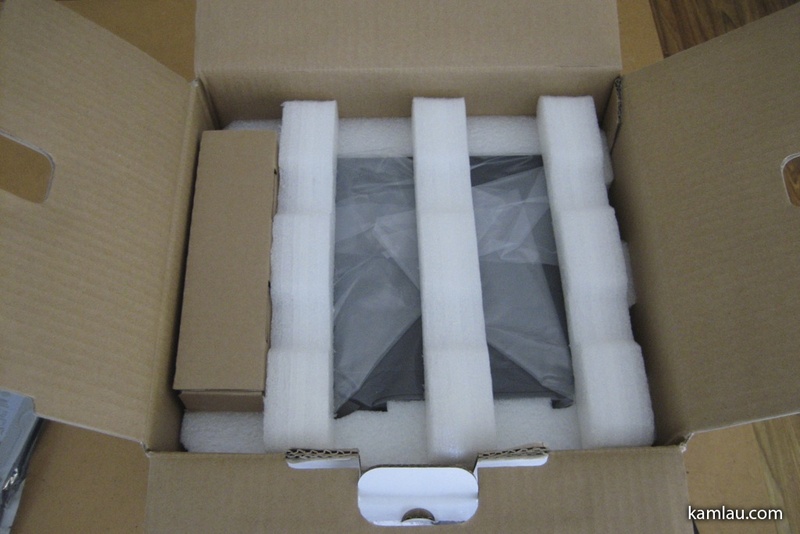 This is the additional hard drive that came with the package. 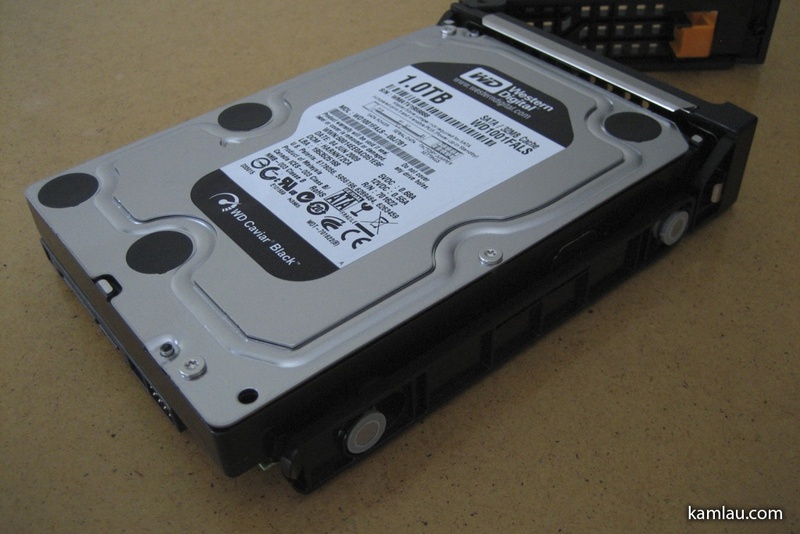 It is a Western Digital Caviar Black (7200 rpm, should be faster than the “Green” hard drive). Sliding it back into the drive bay. I am curious what it looks like on the server, so here we go. From the right side, you can see the heatsink sitting on the Atom CPU. 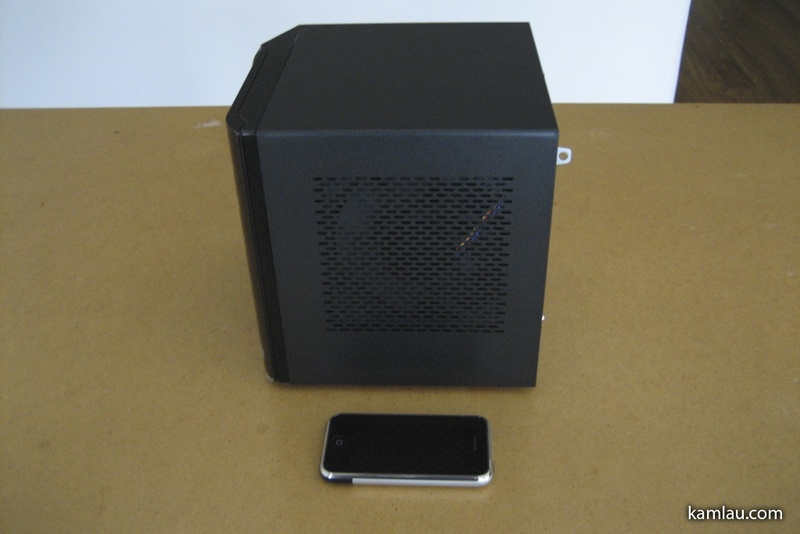 The Atom 230 is a low power CPU and has consumed only 4 Watt of power. Its thermal profile is so low compared to other CPUs that it does not need a CPU fan to constantly cool it down. This is a welcoming feature as CPU fans typically run at higher speed and can cause a lot of noise. 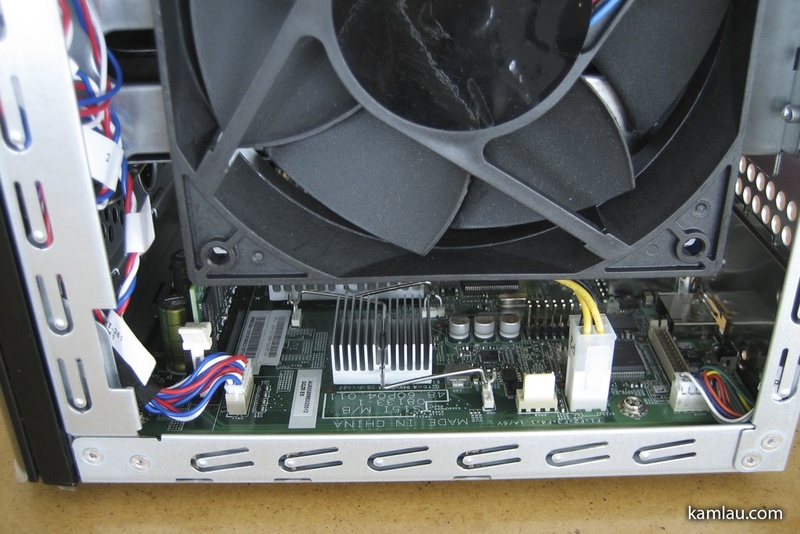 Close to the front of the motherboard are power connections, and there is one piece of RAM installed in between the power connection and the CPU. The red cables on the back side are SATA connections. Here is a more detailed view. The server comes with 2GB of RAM. I think it should be sufficient as I am not planning to run any virtual machines from it. 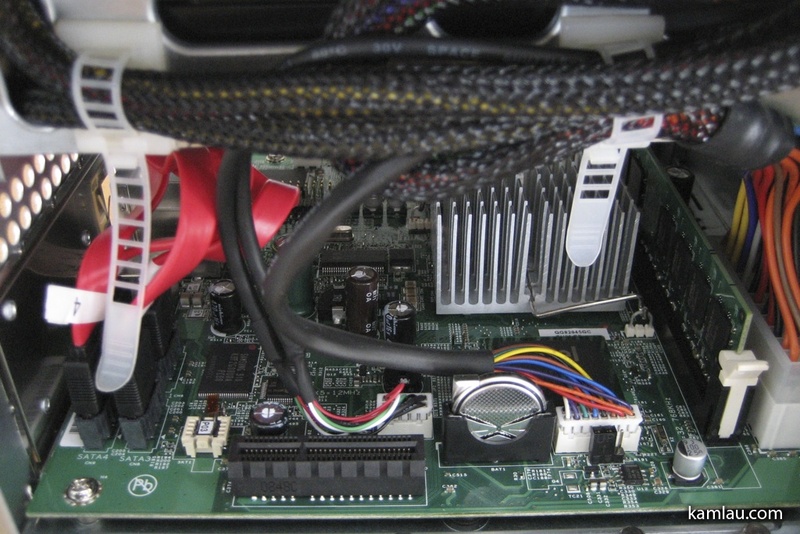 Close to the edge of the motherboard is the PCI-E connector (black). The manual does not have any information about the hardware and I am not sure what you can do with the PCI-E slot. I assume if you don’t want to run the server “headless” you can install your own video card here. If you install a powerful enough video card, you might be able to hook it up to your TV as a media center PC? On the other side is a large fan. It is sucking the air out of the chassis directly to cool down the hard drives. Below the fan is more power connections and another heat sink. The beige port close to the back looks like some kind of ribbon cable connection. Could it be a floppy drive connection?! 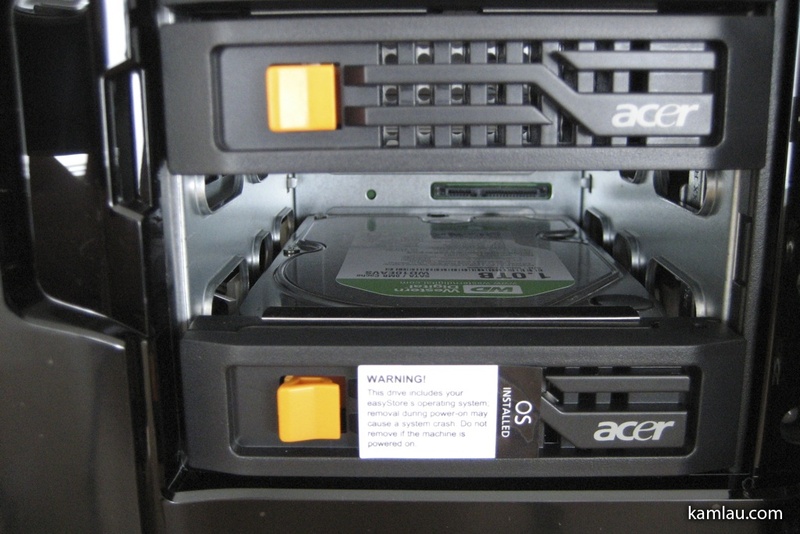 The interior of the Acer easyStore Home Server looks pretty well designed even though it is a compact chassis. Will let you know how well it works for a little while. 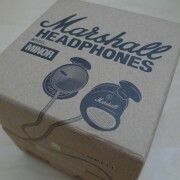 for monitoring operation. Meausured power draw from 102 Volt/60 HZ AC source. It’s ~~ 40-45 watts running (during disk operations) and averages ~~ 21 watts overall (combination of on-line and “suspend” modes). PS: Thanks for your review and pictures!! 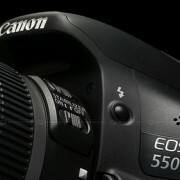 Addn’l info on power draw. Suspend power draw is 5VA/2 watts. I picked up this same machine a few months back. Although I quickly added 2 additional 1 terabyte drives to the same package you bought from NCIX (bringing it up to 4 terabytes storage), I have yet to really play around with WHS’s more powerful features. So far only using the backup features and sharing media files to networked computers and a PS3 (with some issues from time to time). On two separate occasions recently I have received a full slate of email warning from the server (I set up the email warnings through the console a few weeks back) about running at high CPU and storage usage inexcess of 3 minutes. It even sent one about running the fans at too high a speed for too long. However when I checked the console there were no error messages. My storage is nowhere near full so that message doesn’t concern me, however the fan message is a bit scary if it means it’s overheating – my unit is sitting atop a desk with nothing obstructing any of the fans or exhausts. Have you experienced this with yours at all? Hi Kevin, my Home Server currently is only used for file sharing and I am not using it as a media server. The CPU is usually hovering at 68 degrees and the server temperature is around 48 degrees. I moved a couple of my drives to the external enclosure, leaving only two drives running inside the Home Server in an attempt to lower the internal temperature. Do you specifically when the CPU and storage utilization became excessive, what kind of activity it was doing? Would streaming a certain type of media caused it? Also I noticed that the server periodically balance the file distribution across the hard drives. how did you filled all the parameters for the email alerts notifications ? I tried multiple times using an gmail account, but no success to pass the test & receive an email from the server. I am wondering if anyone has an idea of a way to cool the machine down? My CPU is always up around 75C and System is 42C. The other thing I find is the memory usage is always over 52%. The WD Black 1tb drive wouldn’t that make it run even hotter? I want to ad another 2 gigs of space as I already have 2 in the machine and it’s already 80% full. Thoughts from anyone would be great. Thanks. Hey Dan, I have not had the issue you mentioned since I installed Linux. Windows Home Server has the file duplication software that runs all the time and I suspect that is where the problem lies. Probably not what you like to hear but with the couple years of running Windows Home Server, I had not been able to tame the system to be more efficient. 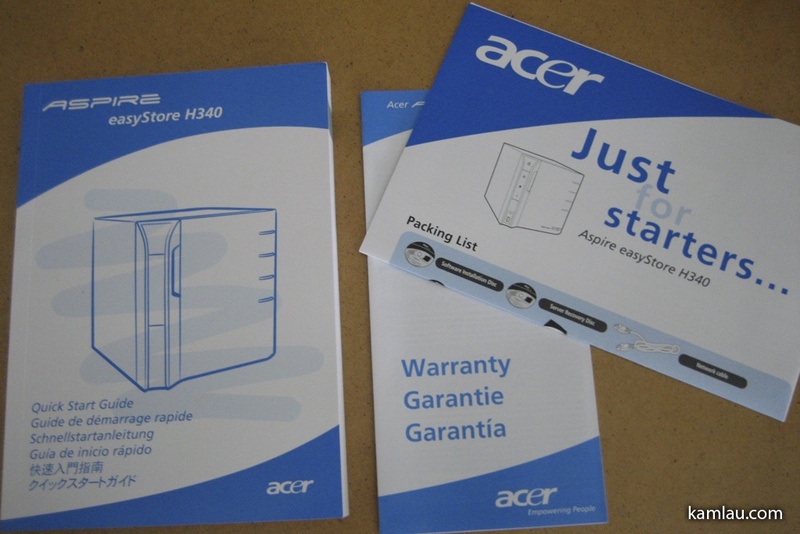 I just bought one Acer Home Server H342, I manage to backup all my files and share folders but I can’t use the USB ports to use it for download pictures directly from my digital camera. 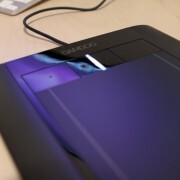 Also I can’t use it to network a printer using one of those USB ports. I wonder why it has four USB ports and how can I use one to download pictures directly to the Acer Home Server or to Network a printer. Well, technically it is based on Windows Server 2003. If you need to connect USB devices to it, you would have to first install the correct driver that is compatible with Windows Server 2003. I didn’t use the USB ports at all until I switched my strategy to use all internal drive bays for storage only devices and installed Ubuntu on an external USB hard drive and boot from it.